Matt Groening, the creator of The Simpsons, will speak at the Sydney Opera House this weekend on the secrets of the show. Now in its 28th season, The Simpsons is one of the mostly widely lauded, and enduring series in TV history. But has it peaked creatively? Is it time to draw the adventures of Homer, Bart, Marge and the gang to a dignified close? A significant body of fans (including this one) think The Simpsons peaked decades ago. They argue its writers regularly recycle plots – which are becoming increasingly incoherent – and the biting satire has paled. Add to this complaints about the increasingly bizarre behaviour of Homer and fawning guest star appearances and the stage is set for a revolt. A chief exhibit of the “Zombie Simpsons” phenomenon is the show’s 500th episode, which aired in 2012. In it, the titular family is exiled from Springfield because other townsfolk are fed up with its members’ boorish behaviour. Later, the rest of the show’s massive ensemble cast joins them, relocating the town of Springfield in the process. This episode was highly derivative, repeating plot points from earlier seasons – including season 9 episode Trash of The Titans and 2007’s The Simpsons Movie. Jerkass Homer is invincible and totally self confident, the evil doppelganger of the Homer that had originally been on the show. He has a point. Where Homer was always loud-mouthed, he’s become positively abusive. And while clumsy, he was still a loveable oaf. Now, instead of being simply dumb, he’s thoroughly stupid. Still, The Simpsons endures – the latest season is averaging 4.6 million viewers in the United States – and continues to have adoring fans. The first of Groening’s talks this week rapidly sold out. The show ambles on in part due to the way it adapts and responds to events around it. For instance, the creators release short (often online-only) clips relating to current affairs. For several US election cycles, The Simpsons has released videos of Homer attempting to vote. In 2008 it was for Barack Obama. This year it was for Hillary Clinton – although he was thwarted by Russian President Vladimir Putin. Another recent short shows Homer at the Sydney Opera House advertising Groening’s visit to Australia. The show’s “couch gag”, which is part of the opening credits but changes for each episode, is often acclaimed by critics. During this year’s 600th episode, the gag was made available in virtual reality. You could view the VR portion through a cheap Google Cardboard device and on YouTube. Another attempt to generate interest saw Homer answer viewer questions “live” in May this year – a first for an animated show. A pre-animated Homer sat at a desk while Dan Castellaneta (the actor who provides his voice) ad-libbed answers to pre-selected questions. Castellanata was motion captured while answering and animated automatically to merge with the existing footage. 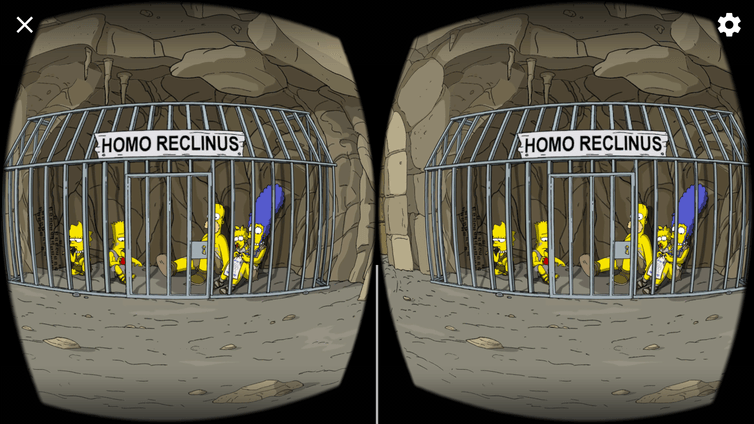 A screenshot of The Simpsons 600th episode couch gag, which was available in virtual reality. Still, while The Simpsons continues to engage with current events, it does so in a more limited way than previous seasons. The weight of legacy makes it harder for the show to find new and innovative takes on old topics. After 28 seasons, it is unclear if or how The Simpsons will ever end, despite the efforts of the Dead Homer Society. Several actors who have voiced recurring (though not central) characters have died over the years. Their characters were retired, but the show went on. Phil Hartman, who voiced ambulance chasing lawyer Lionel Hutz and film-star Troy McLure, died in 1998. Marcia Wallace, the voice of Bart Simpson’s teacher Edna Krabappel, died in 2013. Last year, a provocative tweet by Harry Shearer, the voice of Homer’s boss Mr Burns as well as the Simpsons’ neighbour Ned Flanders and Principal Skinner (among others) sparked rumours he would be leaving the show. But he remained. The Shearer scare followed rounds of wage disputes in 2008 and 2011, both of which were said to imperil the show – but didn’t. Showrunner Al Jean (the series’ executive producer) has given several suggestions as to how The Simpsons could end. One of them has involved creating a “continuous loop” by ending the final scene of the final episode just where the first scene of the first episode began. In the recent live segment, Homer himself claimed “The Simpsons will never end.” When asked directly, Groening tends to duck the question, or offer conflicting answers. My favourite Simpsons episodes stem from two very early seasons. The local politics evident in Marge vs the Monorail (season 4) offered a rich and enduring view of small town life in the face of increasing corporatisation. And the writers’ treatment of Edgar Allen Poe’s classic poem The Raven in season 2 showed care, but not reverence, while introducing a new audience to the poem. In this episode, the poem was narrated by James Earl Jones and the action of it played out by Homer and Bart. It is this subtlety laced with satire that is missing from recent seasons, replaced instead by a brash, careless approach to the audience and their world. Unless The Simpsons can recover these seemingly lost elements, calls for its cancellation will only grow. You can’t live on legacy forever.